Rectangular baskets are perfect for the anywhere in the house. It is a great way to store light linens and other household products such as bottles, office supplies, or documents. At the same time, it is a great way to present food in your kitchen and dining room. The dishwasher safe feature of the baskets make hygienic clean up and maintenance easy! these baskets can also be used as holders for other household items such as school supplies, beauty products, or toiletries. The possibilities are as endless as your imagination! unlike woven willow or wicker baskets, these baskets are hand-woven out of solid cord polypropylene which is resistant to mold, mildew, and bacteria. They are 100% nontoxic, BPA free, and are suitable for direct food use. 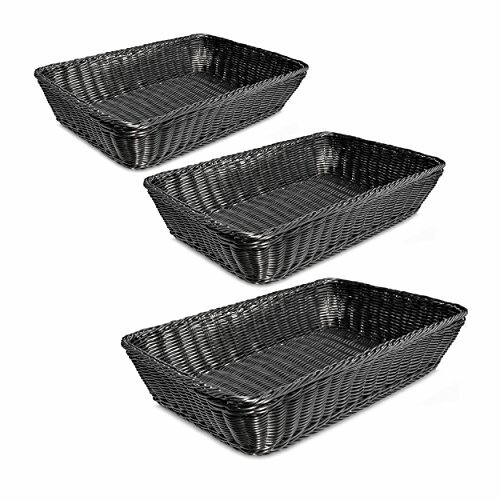 3-PIECE SET: This set of 3 Rectangular Storage Basket will hold a multitude of treasures. Baskets stack within each other for a neat and compact storage when not in use. Stylish organization complement your home. MOLD RESISTANT: Made of flexible, hand-woven solid polypropylene cord which is resistant to mold, mildew, dirt and bacteria. Each basket features a thick trim at the top for easy handling and transporting. It is also certified under the new European food contact standard (lfgb). DISHWASHER SAFE: Design adds a natural touch to your home while they store all your odds and ends. The dishwasher safe feature of the baskets makes hygienic clean up and maintenance easy! NON-TOXIC: Ideal for organizing everything such as cosmetics, toiletries, jewelry, fruits, towels, clothing, and other home essentials. They are 100% nontoxic, BPA free and are suitable for direct food use. MEASUREMENTS: Durable synthetic cord does not crack, or splinter eliminates snags and scraps. Color basket products are also resistant to color discoloration and are easily cleaned and can be maintained with a damp cloth. Baskets measure L 19" x W 14" x H 4" inches. If you have any questions about this product by Colorbasket, contact us by completing and submitting the form below. If you are looking for a specif part number, please include it with your message.